Here's a really lovely article by Peter Calder which appeared in the New Zealand Herald this week. Peter was a bit upset that they didn't use his photo (above) of Willie at the Birth Site (he thinks they lost it! ), so here it is. 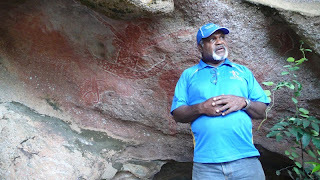 Peter went on our Rainbow Serpent Tour.